2013-14 Upper Deck Quantum Football is a new line from the card maker that focuses on autographs and memorabilia and not physics and other scientific verbiage. Every box has just one pack, delivering an autographed patch card, two autographs numbered to 99 or less and a memorabilia card. All autographs are signed on card. Rookie Signature Patch cards have a large piece of player-worn memorabilia that's encased in PETG, a form of plastic. It also acts as a surface for the autograph, giving the card a layered look. Legendary Signature Patch cards follow a similar format for all-time football greats. All-Time Greats Lettermen Autographs spell out the featured player's last name. Each letter is numbered to 5 or less. Legacy Autograph Jersey cards have swatches of player-worn gear. There's also a patch version. 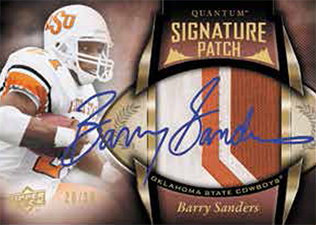 2013-14 Upper Deck Quantum Football has a handful of rare multi-signature cards as well. Leading the way are one-of-one Quantum 9 and Decades Signatures. Each uses a book card format to offer nine total signatures. Moments in Time (#/75) are dual autograph book cards. Every box comes with one card of a 2014 Rookie XRC that's numbered to 175 or less. Johnny Manziel, Blake Bortles, Teddy Bridgewater and Sammy Watkins are among the 30 players in the set. Players in 2013-14 Upper Deck Quantum Football span several generations. Joe Namath, Barry Sanders, Joe Montana, Dan Marino, Jerry Rice, EJ Manuel, Geno Smith, John Elway and Steve Young are among the names on the checklist. The 2013-14 Upper Deck Quantum Football base set has 100 cards. Upper Deck has used the Quantum name before, but in conjunction with parallel sets. This is its debut as a brand of its own. BRUCE SMITH 2013 UPPER DECK QUANTUM SIGNATURE NUMBERS AUTOGRAPH #8 78 -BILLS!! Each letter of last name is limited to 5 or less. Ryan, the amount of products that are being released each year continuously grows and exceeds what the collector in general can keep up with let alone afford. It is getting to be such an overwhelming situation not to exclude some of the hobby boxes released in the above $200.00 range. These cost prohibitive products are mind boggling. On another fact, this is a great opportunity for collectors that can afford such prices to expand their horizons. Our choices seem endless. One of my many caveats here is the cost of groceries. This is just one very small example of what is a necessity for us to survive. With that being said, I want to thank you and your staff for the hard work and never ending hours that Cardboard Connection provides for collectors. how many cordarralle patterson autographed cards do they need to make ? My rating is based off the fact that it is 2014 and the product is called 2013-2014. 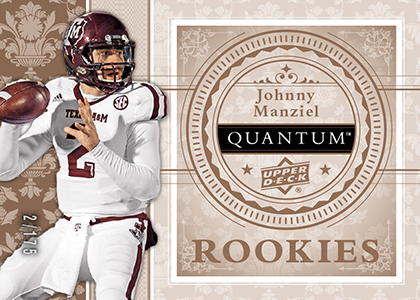 So you’d think it’s a 2014 NFL season release, but no, I see Manziel rookie card….makes no sense…..
At the price point this looks like a pretty decent product on paper. It is basically 2012 Exquisite with a different name and $210 cheaper. Upper Deck needs to realize that the college logo cards do not have the same value as the NFL licensed cards and price accordingly. Autos of players in this will sell for about half price compared to National Treasures or Five Star. They also need to realize that the college cards need to be considered a niche market and not over produce. They should make 3 to 4 products a year. A low end (Upper Deck), one to two mid (SPx, SP Authentic, Fleer Retro, etc. ), and one high (Quanttum). Anything over this is over kill like this year and people will not buy it and the price will be cut in half like this year. They also need to realize that most collectors don’t see any of their cards as RC cards. They are rookies in the NFL, not college rookies. Maybe if they are going to produce college products they should have college rookie cards of a select few of the best incoming college freshmen…..that would be too much work for UD though. Owen Collette � UD is not allowed to produce cards of current college players. It’s not out of laziness. I’m sure they’d love to use current college players, but they can’t. I hope you stay the course and continue to collect football cards this year. There are many great products that will debut soon that are well designed and affordable, not to mention that some of the pulls this year will actually hold it’s value, unlike the 2013 collecting season. I still enjoy Topps Chrome and Platinum. One of my go to products has always been Panini’s Certfied, Prestige, Elite, Crown, and packs of Momentum from the local hobby shop. The first three products mentioned will let me know how I personally feel about the collecting year in graphics design and the overall excitement of the 2014 Draft Class. At the highest end, if I can afford it, I will purchase one of my favorite products that I truly enjoy, Panini Black. Before you change your mind, I urge you to read Cardboard Connections Forum, Card Collectors World. Just click the forum tab at the top. I’ve learned so much more to collecting football cards not to mention meeting some of the greatest individuals ever. It’s really a fantastic community! Who knows, you just might become a member yourself. In summation, it’s all up to the collector. My Mantra is and always will be; “There is no correct way nor a wrong way to collect sports cards”. It’s your collection, you are free to like and dislike products, the same holds true to what you choose to purchase or not to choose to purchase. I wish you the best Mr. Truman. Truman � That’s what I understand. Truman � Not sure. Could just be the ink that was on hand. Toshi – Thanks for the advice – I am not leaving the hobby – I will focus more on what I enjoy and can afford . Ryan — does this Quantum set replace the UD Exquisite one or can we expect it also ? I pulled two Legacy Collection dual patch autos /5. The first being Jim Plunkett 1/5 two white patches on card, and the second being HOFer Jerry 2/5 dual patches, one being three colors. Big fan. Exquisite costs much more and the hits in Quantum of the big names are just as good. Very happy with the product at a rather cheap price.